Madonna’s Manhattan apartment was featured in Architectural Digest back in the early 1990s, but I just came across it on their website recently. I was surprised by the style, which 1) wasn’t really what I imagined hers to be and 2) didn’t really look as dated as you’d expect after nearly 20 years. The design was done by her younger brother Christopher Ciccone, who has since written a tell-all book about her called Life With My Sister Madonna. Madonna told Architectural Digest she loved her office because she could admire the Picasso over her desk while faxing things. Can you imagine? Your own personal Picasso to make faxing more interesting? The kitchen looks surprisingly spartan and workmanlike. I wonder if she ever uses it? Does Madonna cook? Forbes magazine recently named her #1 out of all the top female earners in the music business. She reportedly earned $72 million between 2006-2007 with money pouring in from both live shows and various merchandise. Click here to see more celebrity houses! Not just Picasso over her desk—-it’s hard to see, but looks like what could be a Max Beckman over the fireplace and a Pre Raphaelite like Rossetti in the dining room. Oh, to dream!!! Do you think she actually cooks? i love it. i’d take it any day. I have to say (and I am surprised) that I like it !! I had heard she was a very strict Mum. The ones that push the envelope often are I find. I would love for her daughter or son though, to give her a dose of what she gave her Dad… I can only imagine what he went through !!! Interesting about her bros book, I will definitely check that one out. Have a wonderful 4th Julia, we are headed off to Newport, RI for a few, looking forward to it. You do such a good job of, not only showing us the houses, but giving some background info on the people. That takes a little more work, and I thank you for that. I love it. It is a little “scripted” looking but photo shoots for a mgazine often are. It is too funny that she is such a strict Mom. One of the other readers mentioned this too, but the hellraisers often are the strict ones when it comes to their children. yes, I think she probably does cook a little. I thought the same thing, the ones who are ‘wild & crazy’ seem to be the ones who are super strict. I like the home, but then again it seemed imperial (is that the right word), or something. I like the kitchen and bath, nd the lighting treatment in the hallway “gallery” but the rest is “eh”. Lacks natural light it seems. Show of hands, who here thinks she has ever sent a fax, despite the Picasso? And I hope while she is keeping Lourdes away from TV and such she is instead teaching her how to tweeze, poor dear. It’s a very complex apartment isn’t it? Traditional, modern, a tad gothic, all American….just like her personality. Fits her to a tee. I was hoping that this apt would show some of her Kahlo collection–but it must be at the other homes. Sigh. I suppose the other fabulous artwork will do. Madonna is the new 50…boy am I in trouble. Not my style, but it’s beautiful, as is Madonna. She is still amazing. Just wanted to stop by and say have a great 4th! Madonna’s kitchen is simple & beautiful! It amazes me how her career keeps going on and on – just like the energizer bunny!! Yeah, that’s one of her Lempicka’s in the dining room- nice! She loves her art and has used many of them in her videos. What I love about this apartment is how totally Manhattan it is; I don’t think you could find one like that any where else. I covet the whole thing: it’s beautiful and unique, like Madonna herself. WOW – what a kitchen – thanks for sharing! Considering how colorful Madonna has been, her home is surprisingly traditional. It isn’t really over the top at all. 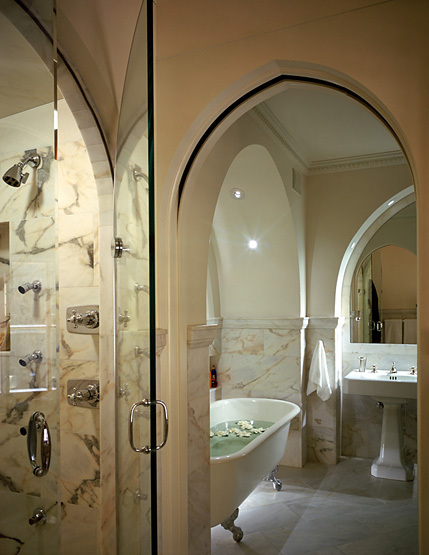 my fav is the bathroom with the clawfoot tub. I like the rest of the apartment a lot better than the kitchen but they left off the best part – the view of Central Park!! I happen to have stumbled into the building she lives in last week while visiting someone else (I only figured out it was her building after talking to the paparazzi stalking her outside) and its a pretty unassuming building but right on the park. Madonna is TOO STRICT! Her children have NO freedom and NO privileges! It doesn’t make sense that she hated the way she was raised, but insists on “copying” it! You would think that most parents who hated the way they were raised would try to be better parents, but some of them turn out to be even stricter and Madonna is” just plain mean”! It is natural to be admiring her Picasso while faxing – there seems to be nothing else interesting in her office design. The positive thing about it is its calmness. Oh, come on, Lisa (comment 25), “Madonna is ‘just plain mean’!”??? I’ve seen her kids and they look immensely happy and smart. Madonna doesn’t let them watch TV. So what? She was not allowed to watch TV when she was a child. TV is not part of her life, it is a logical thing not letting her kids watch TV. I don’t watch TV and wouldn’t let my kids watch the telly either. Does that make us “mean” parents? There are other types of entertainment such as books, music, and games. Oh my, museum like for sure. Also quite cold which, of course, makes it just like her. Wow, I am impressed. Not sure if she spends much time there. I am so happy she is a regular mum, and she does a woderful job. And I am also nearly 50 and love it, 50 is so the new 30. Its a wonderful age, you can get away with so much. She is Amazing, Madonna, if you happen to read this, you rock girlfriend. Cheers Debra in Australia. Did Madonna give her dad a hard time? As far as we are concerned, she was a Straight-A student (the way he wanted), she didn’t watch TV (the way he wanted), she went to Religous School (the way he wanted), so, if you are talking about her carreer, mmm… then I would have to say you are a little too stupid. In your adult life, do you do whatever your parents want you to do? Does anyone know the artist of the painting in her living room? What can i say, she definitely has a good taste. .-= Manhattan apartments´s last blog ..Apthorp Chronicles: The War Over The Upper West Side Pre-War Condo at 390 West End Avenue =-. I love stars adopting children. She has a wonderful looking home and I do have to say that she is strict. But it’s her home, her rules. Thanks for posting this one Julie. I love your blog. I just read that Madonna announced she is giving music a rest, saying she doesn’t have the “time or energy” to sing. Interesting! What do you think about that? I’m all for rules for children, maybe sometimes even a bit strict, like no make up at 10 or 11 or whatever age girls these days try to start looking and acting adult, but no boys, dates, at all, until 18? No strict, more like psychotic.